of General Manager and President of Football Operations (AKA the “face of the franchise”), John Elway, traded their second all-time wide-out Demaryius Thomas along with a seventh round draft pick to the Houston Texans for a fourth rounder. It was Elway’s latest act as the architect of the Denver Broncos. The transaction was one that many saw coming. News of Thomas’ likely ouster leaked a week ago. It came as no surprise to Broncos Country. What was a bit eye-opening, however, was his being shipped off to a team that happens to be the Broncos’ next opponent – the Houston Texans – who play in Denver this coming Sunday. Thomas won’t need to go to his new team. His new team is coming to him. Elway’s decision to send his star player to the team up next on Denver’s schedule was a curious one but it makes sense in the final analysis because Thomas had a monster contract and had, thanks to the emergence of Courtland Sutton, become expendable. Not everybody is thrilled with Elway’s decision but fans generally trust his leadership when it comes to football. “Trust in Elway” is a common mantra. But can he be trusted to make good decisions when it comes to our city, our state and our country? Furthermore, are Broncos fans comfortable with Elway being an outspoken conservative presence on the political scene? 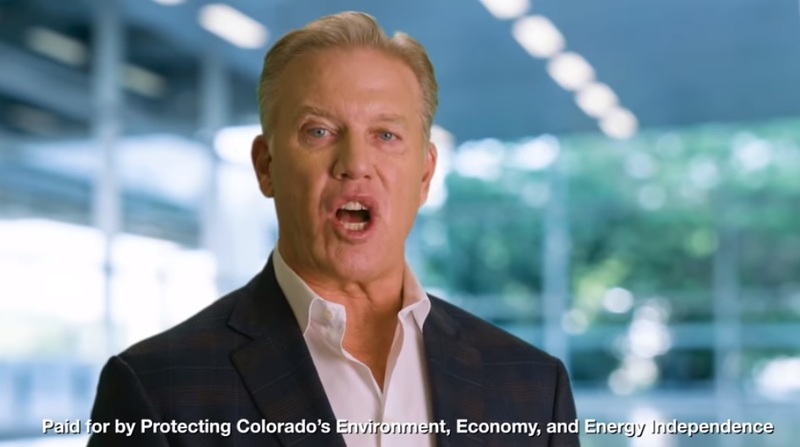 Elway’s most recent foray into politics is to lend his likeness to the opposition of Proposition 112, a democrat-sponsored measure that would limit oil and gas drilling to areas more than 2500 feet from homes, schools and other “vulnerable” areas. Colorado’s oil and gas industry had pumped over $30M into fighting Proposition 112 which they claim will rendor 54% of the state inaccessible to development. Opponents to the measure are thrilled with what’s known as “the Elway bump”. His involvement in the anti-112 crusade is Number 7’s most recent contribution to a conservative cause but it is by no means his first. 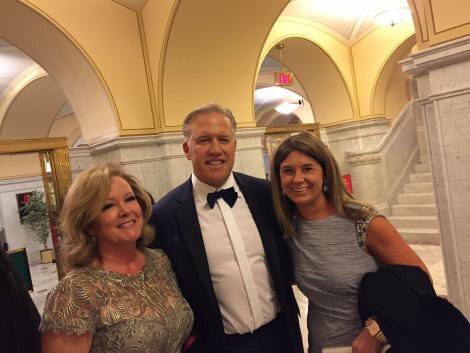 “According to Federal Election Commission records, Elway and his wife, Paige, have given $65,250 to Republican campaigns and action committees this election cycle. The former Broncos quarterback and his wife each gave $1,150 to Stapleton’s campaign, the limit an individual can donate. The Elway’s have also each donated $14,825 to the Stapleton Victory Fund, which gives money to groups supporting Stapleton. In addition, the two gave $10,000 each to the Colorado Republican Committee and a political group called Better Colorado Now. It’s not just the governor’s race that Elway is watching. 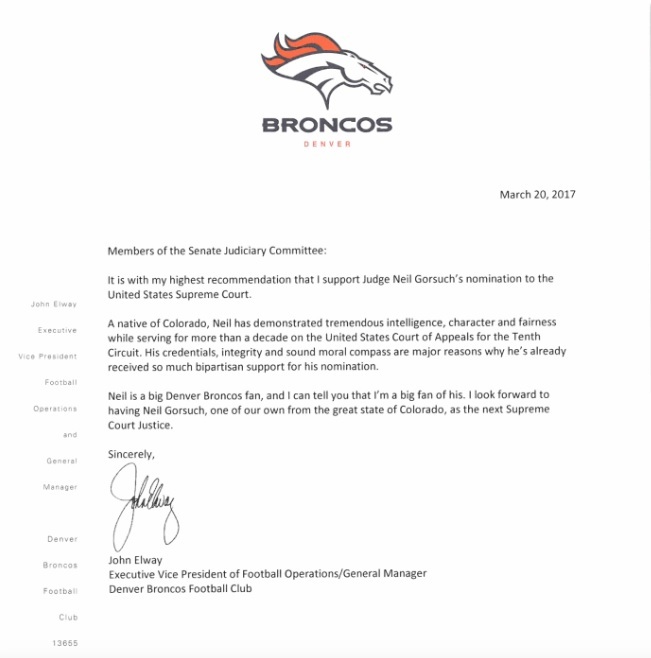 Elway got a ton of flack for his endorsement of Gorsuch – or rather for his use of the Denver Broncos as the backdrop for the endorsement. He sent the letter on team letterhead for heaven’s sake! “While it’s perfectly fine for Elway or anyone else in sports to campaign for political candidates and there’s absolutely nothing wrong with players and coaches taking positions on social and political issues, it’s not OK to criticize others for the same kind of activism. It’s not OK to shut down athletes, asking them to “stick to sports” while those who employ them, owners and team presidents like Elway, get to do and say whatever they want in support of the causes they believe in. It’s also no secret that John Elway has been a voracious supporter of Donald Trump from the jump. He doubtlessly contributed to the campaign and famously made an appearance at 45’s inauguration. Elway also parotted a famous Trump phrase on Twitter in 2017 while denying rumors that the Broncos were pursuing a trade for Bengals back-up quarterback AJ McCarron. Most fans believe that John Elway is the right man to lead the Denver Broncos out of their current state of malaise and into a brighter future. More and more of them, though, are beginning to wonder if he is too busy stumping for conservative politicians and causes to do what’s “right” for the team. Broncos fans come from all backgrounds and political persuasions. 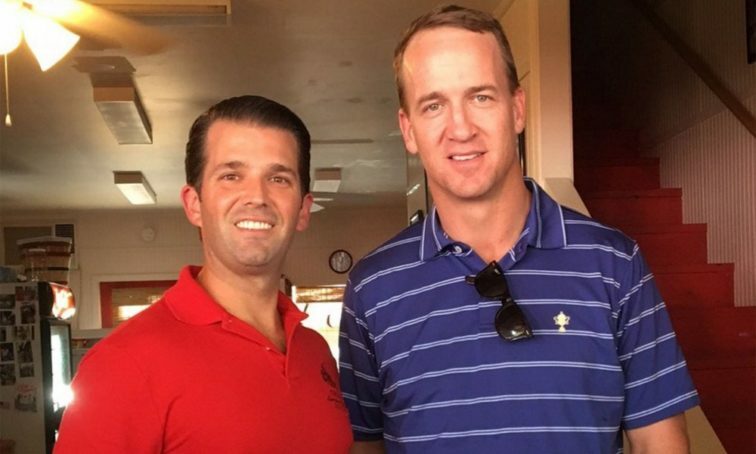 Can Elway simultaneously represent the best interests of everyone in Broncos Country and prop up Trump and the conservative elite? Or would it be best if old number seven would, well, stick to sports.